Facchini served in 78a and 76a Squadriglie before being posted to 365a Squadriglia, 150o Gruppo C.T. He was serving with this unit when Italy declared war on Greece on 28 October 1940. On 4 November, Greek Breguet XIXs from the 2 Mira attacked Italian Alpini troops in a ravine near Distraton. Three of them were intercepted by a pair of 365a Squadriglia CR42s flown by Sottotenente Lorenzo Clerici and Sergente Facchini. The two Italian aircraft concentrated their fire on the leading Breguet. The observer in this aircraft was unable to return fire due to a stoppage. The aircraft was hit and the observer wounded, but by skilful flying the pilot managed to evade the attackers and force-landed at Xyrolimni. The second aircraft, flown by the unit commander, Epismingos (Major) Fridericos Katassos, was shot down in flames, Katassos and Anthyposminagos (Second Lieutenant) Alexandros Sarvanis, the observer, being killed. The third aircraft escaped, unseen by the Italian pilots. Facchini was later posted to 76a Squadriglia, 7o Gruppo, 54o Stormo C.T. flying Macchi MC.200s. During the summer of 1941 the unit operated over Malta. In the early morning on 11 June, 17 fighters from 7o Gruppo escorted a reconnaissance S.79 from the 194a Squadriglia, 90o Gruppo, 30o Stormo on a sortie over Malta. They were intercepted and a Hurricane managed to avoid the escorting fighters and shot down the S.79 and the pilot Tenente Giorgio Pozzolini and his crew (Sergente Maggiore Pilota Marinelli Marino, 1o Aviere Armiere Massotti Mario, 1o Aviere Motorista Zanella Tiziano, 1o Aviere Marconista. Di Giacomo Michele and 1o Aviere Fotografo Tozzi Giuseppe) all perished. Sergente Facchini shot down a Hurricane during this combat and thus claimed the 76a Squadriglia’s first victory. Tenente Armando Cibin from the 86a Squadriglia claimed a second Hurricane. "I was first to attack. I opened fire at 250 yards giving three-second bursts and then closed to 100-50 yards, firing all the time. I observed pieces fall from starboard wing and white smoke started pouring from port engine. I then broke away, at the same time observing five enemy fighters in front. These aircraft did not attack." By now, three other Hurricanes had arrived on the scene, Squadron Leader Rabagliati (Z2680), Flying Officer Peter McGregor and Pilot Officer Jack Grant all attacking the reconnaissance machine and setting its port wing on fire, following which it plunged into the sea. Four members of the crew were seen to bale out, but it seems that they all perished. Flight Lieutenant Norman Whitmore Burnett (RAF No. 70101) in Hurricane Z2480 was shot down and killed. Burnett had claimed a probable CR.42 on 11 November 1940 in the raids made by Regia Aeronautica in the late part of Battle of Britain. 26-year-old Burnett was from Sussex and he is commemorated on the Malta Memorial. His brother Walter Henry also died on service. 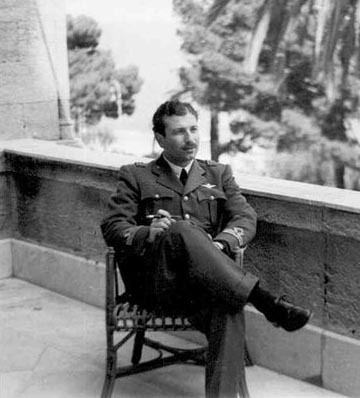 Tenente Giorgio Pozzolini, pilot of the SM 79 of the 194a Squadriglia, who was shot down and killed by Hurricanes from 46 Squadron on 11 June 1941. Tenente Pozzolini had been decorated with two Medaglie d'argento al valor militare. Imager kindly provided by Massimiliano Casanova. 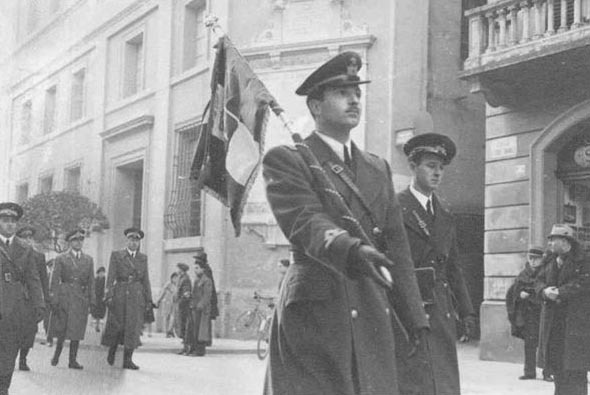 Tenente Pozzolini is seen here as the flag bearer of the 30o Stormo. On 26 July 1941, he claimed one probable or destroyed Hurricane off Malta coast. On 24 June 1942, Mussolini flew in at the controls of his personal S.81, from Elmas, Sardinia, to San Pietro, Sicily, to decorated aviators. In the presence of the Chief of general staff of the Aeronautics, Generale S. A. Rino Corso Fougier (commander of the C.A.I. during the Battle of Britain), Capitano Pietro Calistri and Sergente Facchini, both from 76a Squadriglia, were decorated by the ”Duce”. After the Italian capitulation in September 1943 Facchini joined the Italiana Aeronautica Nazionale Repubblicana (ANR) where he served with 1a Squadriglia, 1o Gruppo. During the war he was decorated with one Medaglia d'argento al valor militare and three Medaglie di bronzo al valor militare. Facchini ended the war with at least 1 shared destroyed while flying CR.42s and a total of 5 destroyed. Biplane victories: At least 1 shared destroyed, 1 shared damaged. TOTAL: 5 and 1 shared destroyed, 1 probable destroyed, 1 shared damaged. (a) Breguet XIXs of 2 Mira Elleniki Vassiliki Aeroporia (Royal Hellenic Air Force). One aircraft was damaged and a second aircraft flown by the unit commander Epismingos Fridericos Katassos was shot down in flames. Katassos was killed together with observer Anthyposminagos Alexandros Sarvanis. (b) Regia Aeronautica claimed two destroyed; RAF losses was one destroyed Hurricane (Z2480) flown by Flight Lieutenant Norman Whitmore Burnett, 46 Squadron, who was killed. (c) Claimed as a probable destroyed or destroyed; is perhaps counted in total destroyed. Adriano Visconti Asso di Guerra - Giuseppe Pesce and Giovanni Massimello, 1997 kindly provided by Jean Michel Cala.